Attractive benchtop housing available with one or two front panel 1/8 DIN cutouts. Suitable for Laureate digital panel meters, counters, timers and remote displays. Suitable for 1/8 DIN size instruments by other manufacturers. Attractive, no-maintenance, black ABS polycarbonate material. Cooling slits in top and bottom surfaces. Easy to machine front and rear panels. Back panel with computer-style C14 AC power inlet and AC power switch. Designed for benchtop and laboratory use, these enclosures provide an alternative to panel mounting of meters when an instrument panel is not available. They provide a finished instrument look to what would otherwise be isolated meters on a work bench or shelf. They are economically priced, provide an attractive professional look, and improve electrical safety. Two versions are available. Model CASE1 provides a single 1/8 DIN 45 x 92 mm front panel cutout, which is set to one side to leave unobstructed front panel space for user furnished indicator lights, knobs and switches. 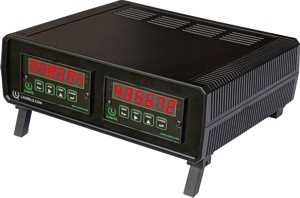 Model CASE2 provides two 1/8 DIN front panel cutouts, for example to display voltage and current on two separate meters. Construction is simple and rugged. Four screws hold together top and bottom clamshell halves, which provide wrap-round grooves to secure identically sized front and real panels. The same screws are also used to attach two fixed rear mounting feet and two front feet which, which can fold out to tilt the case by 9° at the option of the user. The case material is black polycarbonate plastic, which is maintenance free and is easy to drill or saw. Vent slits in the top and bottom surfaces allow air circulation for cooling. 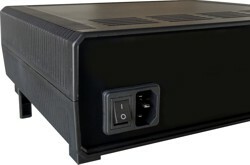 The rear of the case provides an AC power inlet and a double-pole rocker switch. An AC power cord of the type used with computers, electrical feedthroughs, and internal wiring are left to the user. In lieu of electrical feedtroughs, a small rectangular opening can be cut at the bottom edge of the rear panel to bring external wires directly to the meter(s). The case can also be used without a rear panel, since the black open interior of the case is virtually indistinguishable from the black rear panel. Main components Clamshell top and bottom halves, front are rear panels set in grooves. Panel thickness 2.4 mm (0.095"), front and read panels. Tilt Provision Two fold-out legs to raise front of case by 32 mm (1.26") to 9°. Cooling Provision Air slits in top and bottom of case. Electrical connection IEC320 C14 three-prong AC power inlet for 120 or 240 Vac power cord. Power switch Rocker switch, 120/240 Vac, double-pole (not wired). Laboratory Bench Style Instrument Case. Please see our explanations and limitations applicable to pricing and online orders. Prices shown are in US Dollars and are Laurel's manufacturer's suggested retail price (MSRP) in the USA. Orders are processed manually, not directly by our shopping cart system. You don't have to supply credit card information when placing an online order.